Hello! Today I have a masculine card to show you. I have a friend whose husband wears nothing but camouflage and owns an arsenal of guns, so when I asked what type of birthday card he would like, she replied 'Anything with a gun on it would make Louie happy!'. So Louie, this card is for you! I used a very simple sketch by Splitcoaststampers (SC336) to keep the card masculine. My main panel is real wood paper that I received from McMahon Five Designs. If you've never seen this paper before you need to check it out. It is real neat and different and you can even put it through a die cutting machine and make very interesting embellishments. I stamped an evergreen bough on the hunter green panel using an old retired Stampin Up set. My sentiment and embellishments are just three dimensional stickers from DCWV. 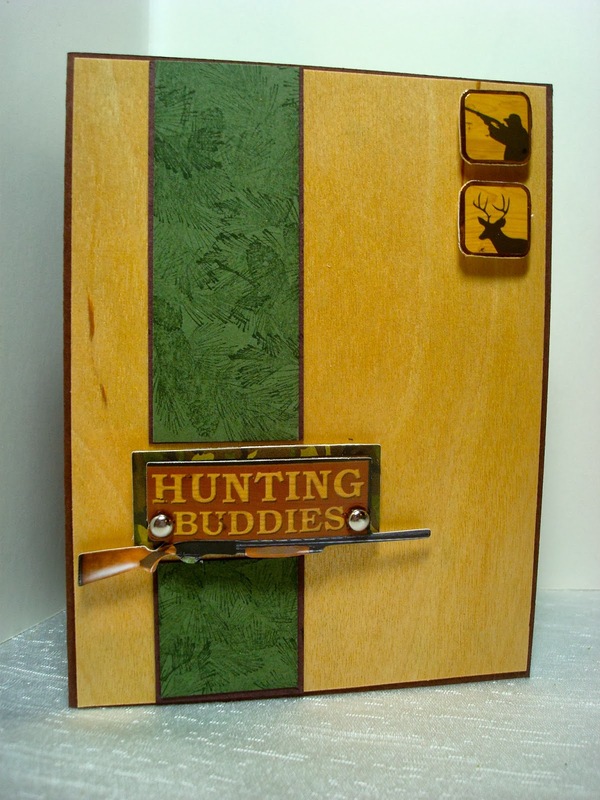 I believe the sentiment was meant to go above a picture of two guys on a scrapbook page, but I used it on a card because it was the only image of a gun I had, and I interpreted it as the gun IS Louie's hunting buddy. Lol! Here is a picture of the two embellishment stickers I placed in the upper right corner. I love the silhouettes and how they match my wood paper. Great masculine card Amy. Wood paper sounds very interesting! What an awesome hunter card Amy!! I love the look of the wood paper and the yellow green combo!! Awesome masculine card. Fabulous hunting card and I know a few people in my life that would love this card, my husband included.